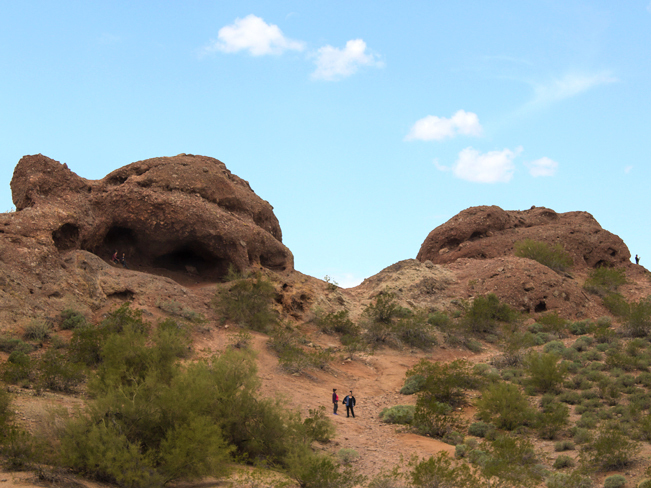 Phoenix AZ's Hole in the Rock Hiking Trail Loop: Is Easy Family Fun! 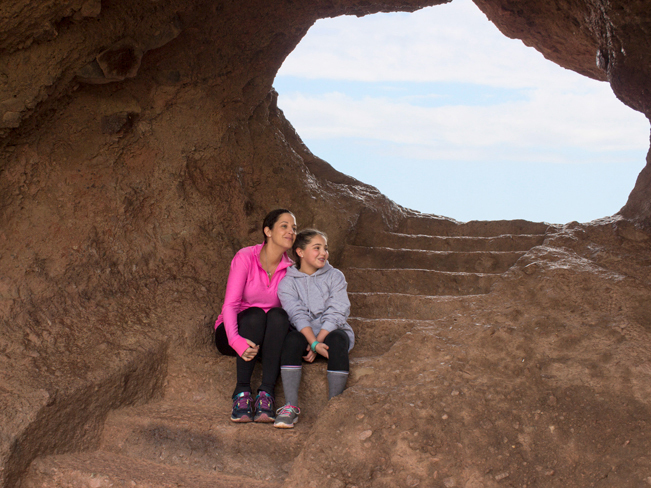 This super-short hike to a huge hole, in a huge rock, is perfect family fun! At just over one quarter mile long, the Hole in the Rock Hiking Trail Loop is both easy and surprisingly scenic. For a full day of fun, add time at the Phoenix Zoo, located literally right next door. 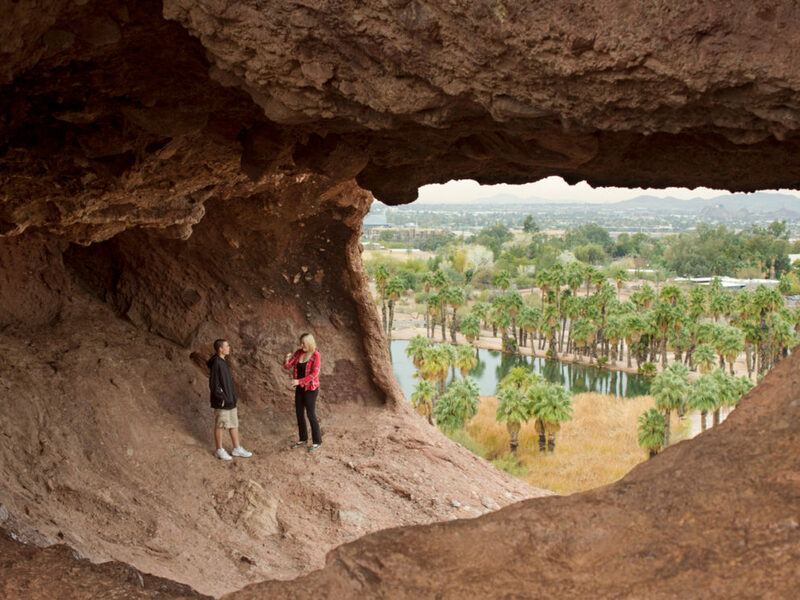 Papago Park’s excellent mix of easy hiking trails, exploration-worthy sandstone hills, Zoo and Botanical Garden make it perfect for spending a day outdoors. And Hole in the Rock, a huge cavern at the top of Hole in the Rock Hiking Trail, is one of the park’s “must see” features. Situated just north of the zoo, this super-short trail makes a quick loop around a huge, otherworldly-looking, sandstone hill. Halfway ’round, steps lead to the hidden entrance of an immense hole in the rock. After ducking through a wide opening, steps, carved into the sandstone, make it a snap to enter the cavern. Inside Hole in the Rock, cool shade and excellent views make it a fun to hang out for awhile. From the mouth of the cave, vistas of Phoenix and South Mountain roll out in the distance. 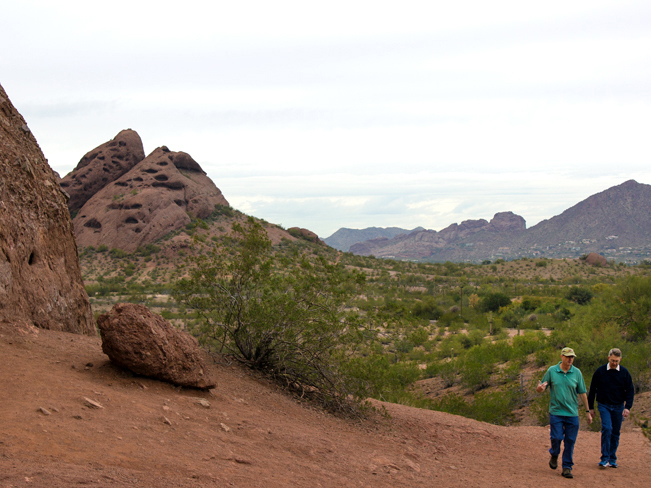 Continuing around the loop, views of the park’s other wack-a-doodle hills, are framed by Camelback Mountain. 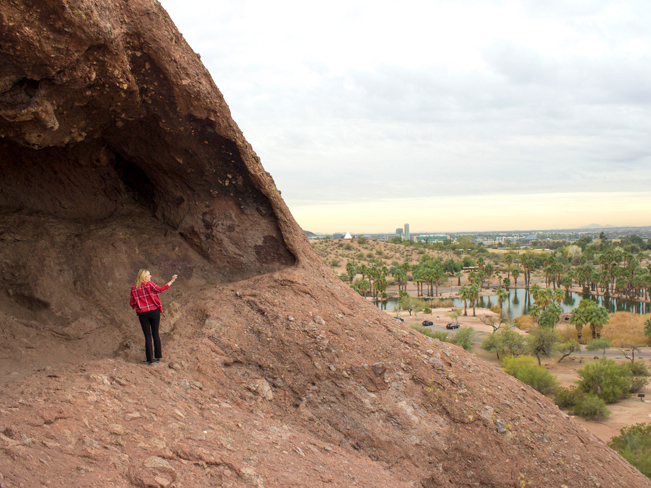 Hole in the Rock Hiking Trail is one of many easy trails in beautiful Papago Park. See the downloadable map at the link below. The sandstone hills along the Little, Big and Double Butte Trails offer lots of other, equally fun-to-explore, nooks and crannies. These trails are typically less crowed than Hole in the Rock Hiking Trail and worth the short jaunt to reach them. 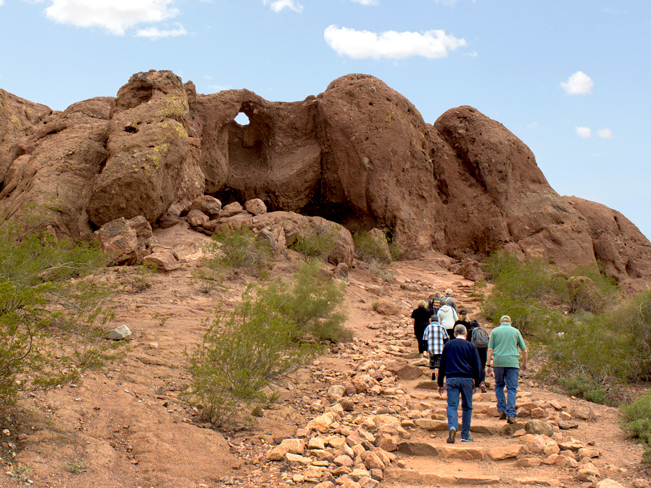 The Hohokam Tribe used the small opening above the entrance to Hole in the Rock hill to follow the sun and mark equinoxes and solstices. If you look closely, their carvings are visible along the edges of the opening. From the northern loop of AZ-202, exit onto Priest Drive heading north. Drive for 1.3 miles on Priest Drive -which becomes Galvin Parkway. Turn right at the entrance to the Phoenix Zoo and continue for 500 feet. 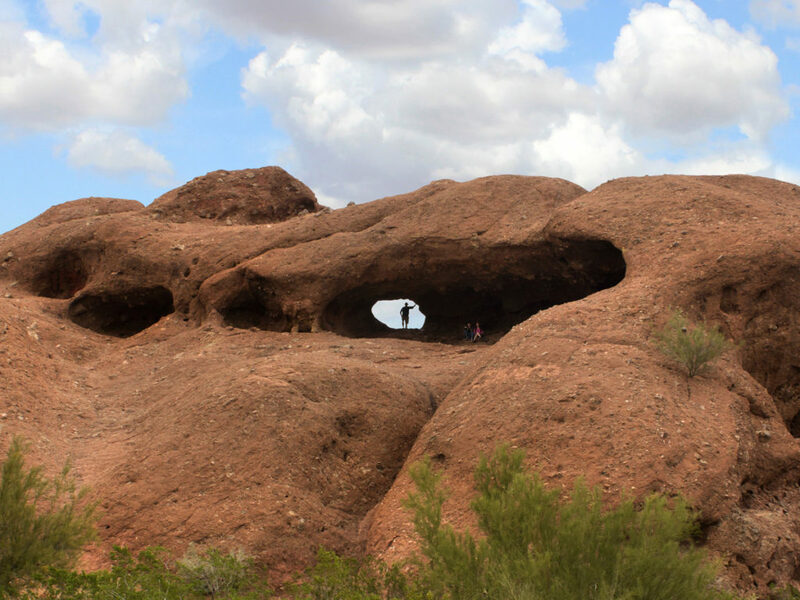 Turn left onto Papago Road – which becomes Ranger Loop Trail and drive approximately 0.5 miles to the parking lot for Hole in the Rock Hiking Trail.